Birthdate: March 14, 467 R.C. (776 U.C.) Count Reinhard von Lohengramm is a young admiral in the Galactic Empire. He was born Reinhard von Müsel to an impoverished aristocratic family. His mother died when he was very young and he only has faint memories of her. His father's will was shattered at about the same time and the only person left to care for young Reinhard was his beloved older sister Annerose. When Reinhard was about ten years old, his family had to move into a middle class suburban neighborhood. There he met Siegfried Kircheis who would become his best and perhaps only friend, but whatever happiness Reinhard managed to find as a child was to be short-lived. The emperor Friedrich IV took a liking to his sister and ordered her to move into his palace and become his new concubine. Afraid that if she refused she would bring down the emperor's wrath on her younger brother, Annerose reluctantly accepted and her father even managed to get some money out of it. Infuriated Reinhard swore vengeance against the emperor, vengeance against the Goldenbaum dynasty and vengeance against the oppressive nobility. He swore that he would never rest until he freed his sister of her predicament and became powerful enough never to be ordered by anyone again. To achieve his goals and with Kircheis by his side, Reinhard joined the military. He quickly rose through the ranks and after proving his ability time and again to the hostile and corrupt nobility, ever reluctant to accept a fallen aristocrat like him into their ranks, he became an imperial high admiral and was elevated to peerage as the "count of Lohengramm". As he steps into the admiralty, the Emperor gives him the prototype battleship Brünhild, which serves as Reinhards flagship from then on. 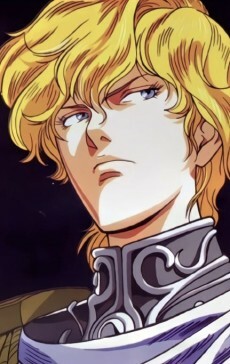 Nicknamed "Blonde Brat" by his enemies and "Golden Lion" by his friends, Reinhard is a handsome and gifted individual, a superb tactician and an unequaled strategist. Brave and noble, he always leads his fleets from the front, much to the admiration, as well as the horror, of his subordinates. Ambitious and determined, Reinhard is only hindered by his immeasurable pride, his warlike nature and the turmoil in his heart.